When trees become an issue, perhaps where they are growing out of control or when they start to decay and die, that’s when it’s important to utilise the specialist services of an experienced tree surgeon. 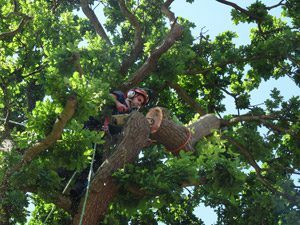 Operating extensively throughout Kent, Sussex, Essex, Surrey and Greater London, our experienced team of tree surgeons have years of experience working with damaged or problem trees, on behalf of both commercial and residential clients. You may require a root and branch clear out, or more intricate surgery to bring a single tree back into line. Whatever the scenario, from a private garden to the grounds of a school – we can’t think of a job that would be too challenging. Before embarking on any work, one of our qualified tree surgeons will undertake a full site survey, to make a proper assessment of the most cost effective and least disruptive approach to the tree that needs tackling. And when the work is completed, rest assured, we will always ensure the site is left neat and tidy. But if it would be your preference to keep the old timber to feed your wood burner, we would be happy to stack the logs in a place of your choice. The Original Tree Surgeons are fully insured up to £5 million for both public liability and employee’s liability insurance. If the time has arrived to bring in a trusted tree surgeon, then we are here at your service. Contact us on 01892 599331.